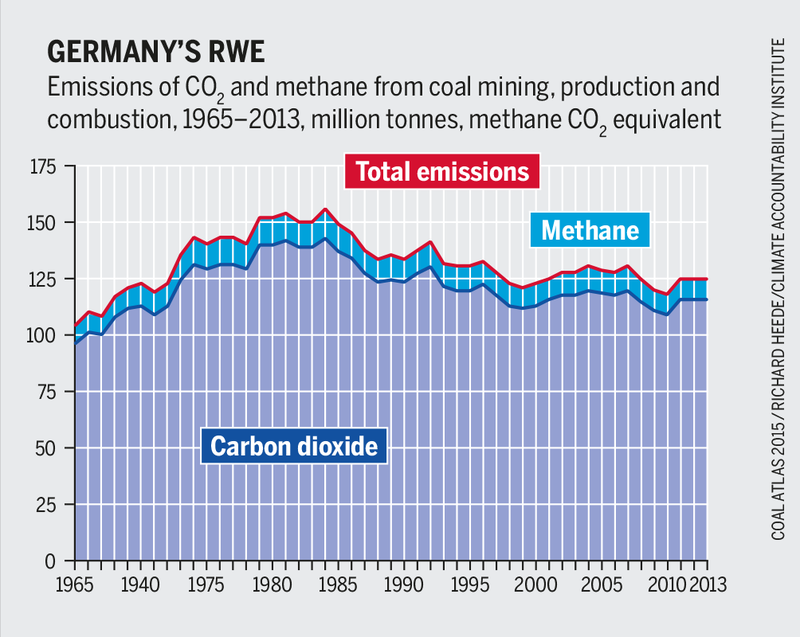 Germany is phasing out nuclear power and has come to rely more on coal for its electricity. Despite a steep rise in renewable energy, the use of coal is endangering Germany’s ambitious target to reduce its greenhouse gas emissions. A chapter from the Coal Atlas. Germany has declared an “energy turnaround”, but is still heavily dependent on coal. Lignite is the only significant fossil fuel that the country has and does not have to import. The reserves are estimated at 40 billion tonnes, and are split among three major regions: the Rhineland, Lusatia and central Germany. 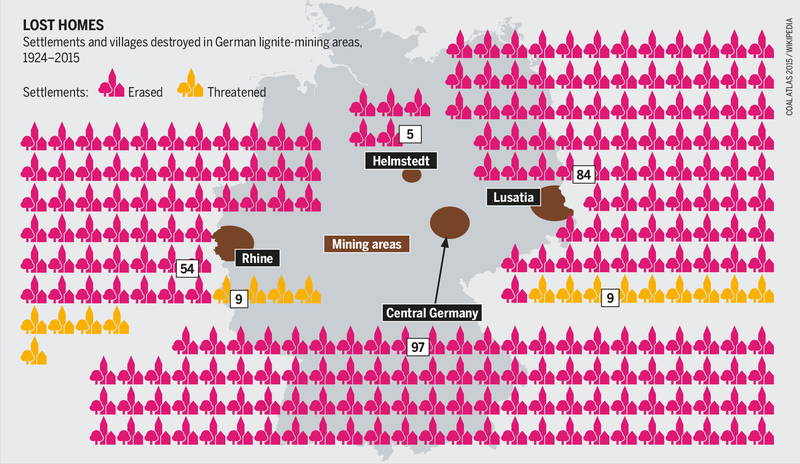 In 2014, more than one-quarter of the electricity produced came from lignite, and its output of 178 million tonnes a year makes Germany the world’s biggest producer. The industry has benefited from 95 billion euros in subsidies (in real terms) since 1970, and open-cast mines have gobbled up 176,000 hectares of land. Current mines cover 60,000 hectares. The mine sites are rehabilitated and brought back into cultivation after mining ends, but the original ecosystem never fully recovers. In many cases, the pits are flooded to form lakes. In the Rhineland that means diverting river water into the pits for decades on end. The negative environmental impacts of mining include damaged ecosystems, degraded soil, acidified water, water contaminated with sulphates and sludge containing iron, as well as disturbed groundwater regimes. In Lusatia, sulphate from nearby open-cast pits threatens the water quality in the River Spree and, therefore, Berlin’s drinking water supplies. The federal states that host lignite reserves plan to continue mining well into the 2040s. Vattenfall, the state-owned Swedish power generator, plans to develop five mines in Lusatia in eastern Germany. Two of these were recently approved. The excavators will demolish ancient Sorbian villages, even though this minority group is protected by the constitutions of both the federal states of Brandenburg and Saxony. In North Rhine-Westphalia, in western Germany, the state government decided to reduce the size of Garzweiler II, an extension of an existing pit. If Germany intends to stick to its target of cutting its greenhouse gas emissions by 80 to 95 percent by 2050, two-thirds of the lignite reserves already approved for mining will have to stay in the ground. In contrast, Germany’s extraction of hard coal will end in 2018. The three pits still in operation produced 7.6 million tonnes of coal in 2014. Germany still gets about 18 percent of its power from hard coal. Despite repeated public criticism regarding the human rights situation and environmental effects of coal mining in many coal-exporting countries, Germany imported more than 56 million tonnes in 2014, of which 42 million tonnes were destined for power stations. Most of this coal comes from Russia, followed by the United States, Colombia and Australia. Germany’s remaining hard-coal mines are closing down because government subsidies are due to end in 2018. Without these government funds, the mines would have been unprofitable since the middle of the 20th century. Since 1970, the mining companies have benefited from subsidies to the tune of €327 billion in real terms. One of the so-called “inherited liabilities” of hard-coal mining is the need to pump out mine water to protect groundwater. From 2019 onwards, dealing with this and other liabilities will cost at least €220 million a year, indefinitely. The money is supposed to come from an endowment fund set up by the industry, but this will probably not be sufficient to cover the costs. Unlike hard coal, the inherited liabilities of lignite are not recognized politically, and the perpetrators have not had to make adequate financial arrangements. Furthermore, the public cannot access the financial presumptions and models that the mining companies use to make plans for reserves to cover damage caused by mining. Renewables account for around 26 percent of Germany’s energy mix. That is slightly more than lignite, but lignite and hard coal together make up 44 percent. Fixed feed-in tariffs (long-term contracts for energy producers) have spurred the expansion of renewable power and made compensation for the loss of generating capacity possible after Germany decided to turn off its nuclear power plants. Germany is likely to miss its climate goal of 2020 (a 40 percent reduction in greenhouse gas emissions compared to 1990), mainly because of the increase in burning coal. In addition to those measures that have already been decided, supplementary measures are needed to achieve further necessary reductions in the power sector. In early 2015, the government proposed to limit emissions from coal-fired power plants with a so-called “climate levy” on old, emissions-intensive power plants. This plan was supported by environmentalists. The public debate over these proposals has been very lively, and there has been strong and effective resistance from coal companies, trade unions and the governments in the three affected states. The failure of the climate levy and its replacement by a capacity reserve for old coal plants demonstrates the strength of the coal lobby. Unfortunately, the replacement will not be enough to attain the climate goals. Many local governments own shares in the energy group RWE, and they fear a loss of income, which is a major obstacle to the switch away from coal. Nevertheless, the general public’s opinion has turned against coal, and opposition is rising. In fact, accelerating a coal phase-out is the top priority for German activists. This article is part of the Heinrich-Boell-Stiftung series on "Energy Transition Around the World".